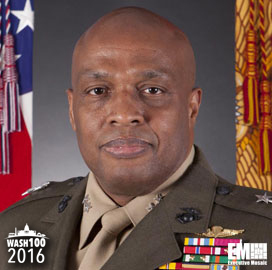 Executive Mosaic is pleased to induct Lt. Gen. Vincent Stewart, director of the Defense Intelligence Agency, for the second consecutive year, into the 2016 edition of the Wash100 — Executive Mosaic’s annual selection of influential leaders in the government contracting arena. The Marine Corps officer took the helm at DIA and the Joint Functional Component Command for Intelligence, Surveillance and Reconnaissance in January 2015 after his stint as commander of Marine Forces Cyber Command. He became the commanding officer of headquarters battalion, 2d Marine Division at Camp Lejeune in North Carolina and of the 1st Intelligence Battalion at Camp Pendleton in California, among other command tours. As DIA director, Stewart leads the agency’s efforts to help defense agencies with their intelligence functions. Executive Mosaic extends its congratulations to Stewart and the DIA family for their selection to receive this award.